Cut and Paste was a project brief I was given as I went into my fourth foundation project in design. This project was based on the art of collage which is a technique of composing a work of art by pasting on a single surface various materials not normally associated with one another such as newspaper clippings, parts of photographs, theatre tickets, and fragments of an envelope. The first thing I set out to do once our project overview was finished was walk to the local recycling centre and gather random sources of materials so I could get my hands on anything that may come into good use or that would spark ideas. It was a worth while trip as i had sourced a variety of materials including books, tiles and cards. Once I had materials I began to rummage through and just cut out what appealed to me. There were a couple of wedding cards had picked up and so I decided to see what I could do with these. An artist named Martin O’Neill used diamond shapes in his collages and this appealed visually aesthetic to me therefore i looked at some of his work to gain a better understanding and see how i could combine this into my work. As I was dealing with greetings cards I thought it was appropriate to include pages of books to make the background look like a letter and I then cut out words associated with love in hearts and had them swirling out of the envelope for visual effect. As i finished this piece I decided that the theme of love was definitely an option I could pursue and develop for the next week or two. In my next experimental piece I looked at Sonnet 116 by Shakespeare which is renowned for being romantic and used a picture of a woman so it resembled that this is a man thinking of a loved one. As I approached the next stage of my project I wanted to see what was possible with just paper such as origami. Therefore i tried a few different types of origami and made up my own which was a success as it help me figure out the aesthetic into my next pieces of work. I continued to look at love letters and made an envelope from a book and had the letters of love overflowing from inside it and I really thought this had a good visual impact on the physical meaning. It was fun and symbolically showed the sending of a love letter and how one feels when opening/reading it. The above collage reads ‘The lines stitched into highways; the never-ending seams, on roads that are less travelled, dividing you and me. I wish I could unravel, the fabric in-between, and tear away the distance, to bring you close to me’ (By Lang Leav). 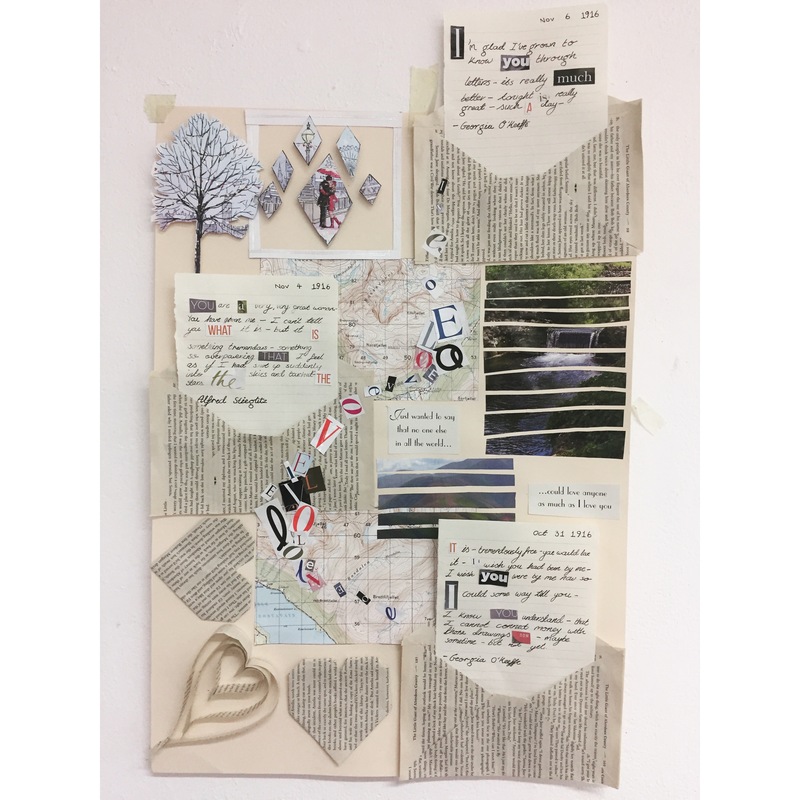 In this piece I used a map to demonstrate the distance and sending to/from of love letters as well as putting some words in collage from a magazine for visual effect. Images of a couple were also used from a magazine but as the project progressed I decided cards were more suitable. Two artists that came into my work at this stage were named Sarah Grace Gates (who produced collage with love letters) and Jelle Martens (Who used geometry/diamond shape and pictures of nature/scenery i.e. ‘in the quivering forest’). By combining my select artists and own ideas i came up with a rough final of what I wanted the outcome of this project to be as seen above. My next decision was on composition which was important if i wanted my work to attract peoples attention and intrigue them into what I was doing. This took form within my sketchbook and gave me a good stance into the final direction. The last bit of research I did was looking into famous couples and their love letters however it became clear very quickly that I was not going to be able to directly take these as they were far too long, I had to be very select with what I was choosing to take and adapt them to make sense and show a correspondence as letters are not a one way thing. This is when I came across the book ‘My Faraway one: selected letters of Georgia O’Keeffe and Alfred Stieglitz, vol 1, 1915-1933’ I found these to be really relevant as O’Keeffe being an artist and Stieglitz a photographer it made sense to include them in my work after researching many historic couples and not being able to find correspondents. As I progressed through the book I wrote abstracts that I found interesting and ones which had responses. G.O: It is – tremendously free – you would love it – I wish you had been by me – I wish you had been by me now so I could some way tell you – I know you understand – that I cannot connect money with those drawings now – maybe sometime but not yet. A.S: You are a very, very great woman. – You have given me – I can’t tell you what it is – but it is something tremendous – something so overwhelming that I feel as if I had shot up suddenly into the skies & touched the stars.